LIFE IN A SMALL KANSAS TOWN: Why grow gourds In The garden ? When a tree is best. Why grow gourds In The garden ? When a tree is best. 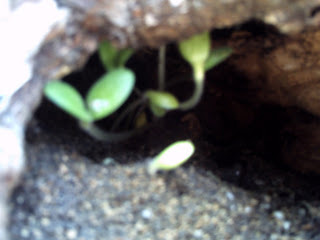 I have decided to get creative with where to plant gourds . 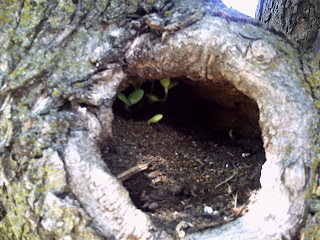 I have a hallow tree that has a deep foot and half depth so I filled it with potting soil and have started my gourds in the tree .I am hopping they will climb up and vine around the tree limb . Gourds are fascinating. 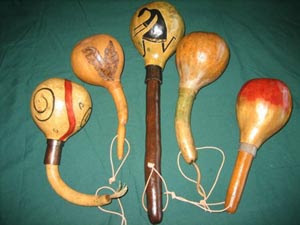 The Aztecs fashioned them into musical instruments and in Haiti, it was the official currency. The Celts celebrate their New Year on November 1st and believe that on the night before the New Year, October 31st, the portal between the world of the living and that of the dead is opened, allowing the dead to return to earth. They call this night "Samhain." November 1st also has a macabre significance as it is the start of winter and the "season of death" during which many people would die from the scarcity of food. During Samhain, the Celts paint scary faces on gourds to scare away the returning spirits and paint their own faces as well. It is also believed that faeries dress as beggars during Samhain and go door to door asking for handouts. 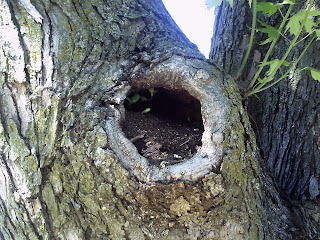 Those who refuse are believed to be in for some mischief from the faeries. The Romans conquer the Celts. The festival of Samhain falls on the same days as the Roman celebration of the harvest, Pomona. With the two cultures living together, the two festivals merge into one, with the theme of apples and the harvest becoming part of the annual festival of Samhain. Unable to get the people to stop their pagan celebrations on October 31st and November 1st, Pope Boniface IV designates November 1 All Saints' Day. On this day saints and martyrs are to be honored. This move does not eliminate the pagan rituals as hoped. Instead, the people simply celebrate both festivals at once. 1500s: By this time, Samhain and All Saints' day are mingled so well that they are one and the same. It has a new name as well: All Hallows' Day. The night before All Hallows' Day is called All Hallows' Evening. The villagers call it Hallow Evening, or Hallowe'en. They make great shakers .noise makeers you can paint them and add all sorts of decorations to them .